Here's almost everything you need to get a small garden going - just add a planting mix and your favorite plants! (or pots for growing in a grow room or greenhouse) Easy for 6 plants in pots up to 12" diameter. Reservoir should be at least 3' above ground level. Optional pressure regulator attached to garden hose or faucet and can provide enough water for up to 500 Blumat Carrots. 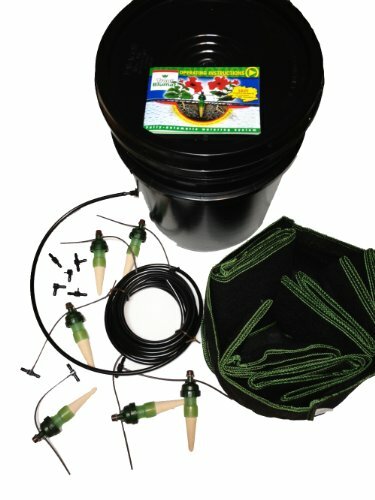 Includes 6 highest quality 5-gallon grow bags. Note: Blumat Classics (Juniors) and bottle adapters are designed for houseplants while Tropf-Blumat Sensors (the one's with the small adjustable brown knob on top) are designed for greenhouses, growrooms, decks, and outside gardens. Blumats Austria says "Please don't use the Tropf-Blumats indoors" because if hooked up to a constant water source and a pet, guest, or user-error somehow causes a run-away, it could damage an indoor floor, drywall, carpet, or furniture. We, and many others, do in fact use these systems inside ourselves, however, we are generally around enough that if a problem did occur, we would be able to notice a problem and fix it in time (not the case if someone is on vacation). We have many guides for being able to set these up the proper way and avoid a run-away or general mistakes. Please contact us for any help, we are always here to help make your life easier.